Acer have become a leading name in tech and much of their deserved success is down to their marvellous laptop computers. Acer have developed their range of laptops to suit all users from students looking for budget machines to enterprise users who need the highest possible specifications. Whatever your need and whether you are at home, studying at college or a busy professional you will find an Acer laptop that is perfectly suited to you. Aspire Ultrabooks are Acer's top of the range laptops and these machines certainly deliver an incredible performance. With their full HD touchscreens these laptops provide exceptional picture quality but, of course, it is under the hood where the Aspire Ultrabooks score so highly. Fast processors, plenty of RAM and HD graphics cards ensures these laptops are the ideal business or multimedia machines. But if your budget doesn't stretch to an Ultrabook Acer have many mid-range and entry level laptops that offer great performance at a much more affordable price. If, however, you are looking for a slimmed down no-frills laptop try a Chromebook. 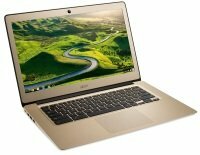 Using the Google Chrome operating system these laptops provide an affordable and easy route into portable computing. No matter which Acer laptop you choose you are assured of finding optimal screen displays, comfortable keyboards, top of their class performance, long battery life and extra built-in functionality with plenty of connectivity including USB 3.0 interfaces. Acer pride themselves on delivering superb looking laptops. With their slim profiles and lightweight designs these laptops look and feel great. And they are easy to carry around so you can take your computer with you on the commute or trip to the coffee shop. We always have the best prices you will find anywhere here at Ebuyer so why not treat yourself to a new Acer laptop?